A new license plate will soon be available, and it comes with park perks. The new plate, which will feature a parks and trails design, will support Minnesota state parks and trails, and gives free entry to vehicles sporting them. Minnesotans who choose the plate will pay an annual contribution starting at $60, plus tax. This total includes a one-time $10 fee for the plate itself and a minimum $50 contribution (renewable annually). The plates are expected to be available in October 2016. Now, a design is needed and you could be the one to provide it. The DNR is holding a contest for the best design with entries being accepted May 2 – 6. “We’re looking for an image that captures the essence of Minnesota state parks and trails,” said Erika Rivers, director of the Parks and Trails Division at the Department of Natural Resources. 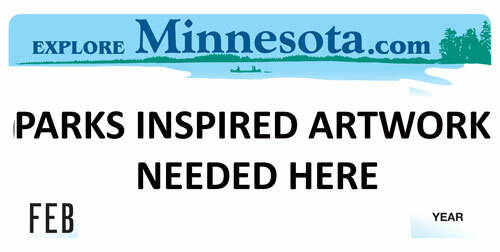 A panel of judges will evaluate entries based on criteria such as creativity, quality, representation of Minnesota state parks and trails and suitability as a license plate image. You can review the official rules and download the template at the DNR website. Good luck to all who enter!